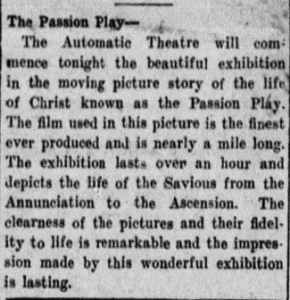 This is a newspaper advertisement for a film titled “The Passion Play” from the Morning Astorian published January 15, 1908. It is an advertisement solely comprised of text. Its focus is on the film itself, advertising the length and content of the film. The reference to the length of the film being “nearly a mile long” could easily be an exaggeration, yet it is quite impressive. 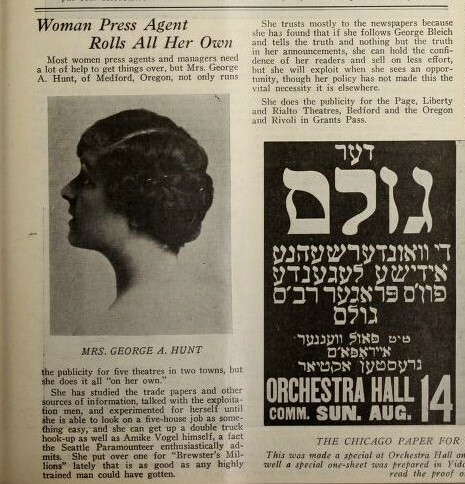 Then the article immediately returns to objective fact by telling the reader how many minutes the film is, giving multiple answers to the question “How long is the movie?”. This is possibly to first impress the reader with the sheer length and impressive quality of the film and then let them know in terms they can understand how long the film is. The content of the film is however the major selling point for the film. And yet there are very few details provided about the film itself. The reader is told the film is about the life of Christ. But there are no details as to which studio produced the film, who directed it, and who stars in it. The audience may at least be curious as to who will portray Christ. This leads to the assumption that it is a low-budget film and studio without any recognizable names attached to it. The theater is relying on the topic of the film to be the main selling point. This is also emphasized by the vague word choice used in reference to the film, by simply calling it “this wonderful exhibition” no details are made known about it. Another interesting aspect is the date of publication. This was published in the middle of January. It would make a lot more sense for a film like this to be shown before Christmas or Easter or any other significant Christian holiday. This is reflective of the religious devotion found in this time, even the most pious could allow themselves to go to the movie theater to watch a film about Christ.